Applying to study modern languages, German life, German Literature, Why study languages? 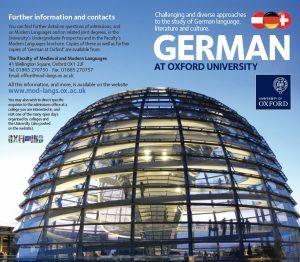 Last week, we heard an overview of German at Oxford from Prof. Henrike Lähnemann. This week, Hannah Hodges, a current second-year undergraduate of French and German at St Peter’s College, tells us what motivated her to study German from scratch or ‘ab initio’. The popular YouTube videos “German compared to other languages” didn’t really help me when justifying my decision to choose German as my ab initio language. Who would rather commit to four years studying the language whose word for butterfly is Schmetterling and not papillon or farfalla ? Now in my second year of the ab initio German course, I stand by my decision to take up German as part of my degree. Why? Well, despite its reputation for being complicated, German is actually quite a logical language (at least compared to the endless list of French grammar exceptions anyway!). I may still stressfully pause before I say anything in order to figure out which translation of the I am going to use, but I can (kind of) see the logic behind the dreaded cases. Moreover, after spending seven years trying to decide when to use the passé composé, imparfait, passé simple or passé antérieur (what even is this?) in French, you can imagine my relief that in German there are only two commonly used past tenses and it’s not (too) important which you use in speech. And future? No need to worry about verb stems: with German you can use the present tense and just add a word like morgen (tomorrow) or nächstes Jahr (next year) which makes it pretty obvious you’re talking about a point in the future – logical, right? Joking aside, the thought of reading Thomas Mann’s paragraph-long sentences does at times make me question my own choice, but the usefulness of German in understanding the development of modern European thought and being able to read seminal texts in their original language such as Immanuel Kant’s Beantwortung der Frage: Was ist Aufklärung? (Answering the Question: what is Enlightenment) is rather rewarding. But perhaps the best thing is that German has the reputation of being a difficult language. Therefore, when you casually drop into conversation that you only started learning it a year and a half ago and someone asks you what the longest German word you know is, you can confidently roll off the compound noun Kraftfahrzeughaftpflichtversicherung. Moreover, you can explain why the word is logically constructed. Trust me, people will think you’re amazing. So, don’t be put off just because the word for daisy is Gänseblümchen.